After someone completes your Relevant Tools web form you can send them an immediate email response. Additionally, you can automatically continue your connection with your new contact using scheduled auto responders. Also known as drip marketing, a scheduled auto responder is a series of messages that are sent at specified intervals after the initial signup has been made. Now to set up scheduled auto responders using Relevant Tool&apos;s web forms is the subject of this tutorial. However, before you get started defining your scheduled auto responders you should first create your messages using one of the methods described in one of the tutorials in the Email Messages and Mailings section of these tutorials. After the auto responder messages have been created click on "FORMS", at the top of the screen, to display the Forms Create New Form⁄Edit and Existing form screen, shown below. Next, using the pulldown menu, shown above, select the form you would like to use for the series of auto responder messages. Note: If you have not yet created a web form, please see the tutorial on Getting Started with Web Forms for informtion on how to create a web form in Relevant Tools. Once the form has been selected, from the pull–down menu, the Test Form screen, shown below, will be automatically displayed on your screen. Click on the "Scheduled Responders" link in the Form Operations section on the right–side of the screen. The Scheduled Responders screen, shown below, should now be displayed on your screen. When Scheduled Responders screen is displayed you will see the DEFINE A NEW SCHEDULED RESPONDER button. Notice the message informing you of the currently selected form in the middle portion of the screen just above the define responder button. This is one way to confirm the form selection for the Scheduled Responders that are about to be created. If there are any scheduled responders previously set up for this form, this is where they would be displayed. To continue, click on the "DEFINE A NEW SCHEDULED RESPONDER" button to define a new scheduled responder. Next, using the Message to send: pulldown menu select the message you would like to use for the scheduled responder, shown below. Then, using the When: pulldown menus set the time interval for the message you would like to send; for example, 1 week after signup. Finally, click on the "CREATE" button, at the bottom of the screen. After the CREATE button has been clicked on, the screen below, the Scheduled Responders screen, is redisplayed with the newly created scheduled responder. From here you can review and delete the series of messages, at any time. 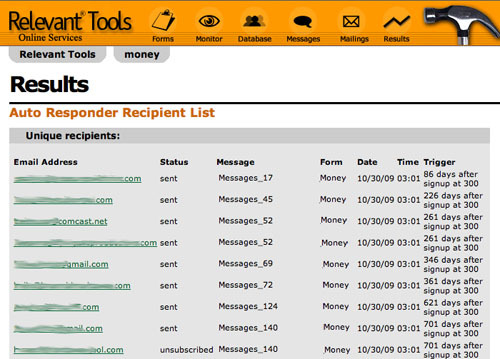 Every night Relevant Tools will automatically check your databases to determine if any signup records qualify for the next message in the series. You can view the results of your scheduled auto responder message series by clicking on RESULTS, at the top of the screen followed with a click on the Auto Responders menu option in the submenu at the top of the Results screen. To view the details of a particular day⁄message simply click on the auto responder link in the name field, shown above. A detailed list of each email address that qualified for that particular day is shown with the message that was sent and the trigger that qualified that particular address, shown below. As always, if a user decides they do not want to continue receiving the series of messages they can always unsubscribe and they will not receive any additional emails. With scheduled auto responders you can automatically keep in touch with your customers and prospects with a series of scheduled emails that deliver your message for you. Put Relevant Tools to work.